STOCKS AS THE SMART MONEY? The biggest debate in markets at the moment is which markets, stocks or bonds, is sending the correct signal on the outlook for the economy. 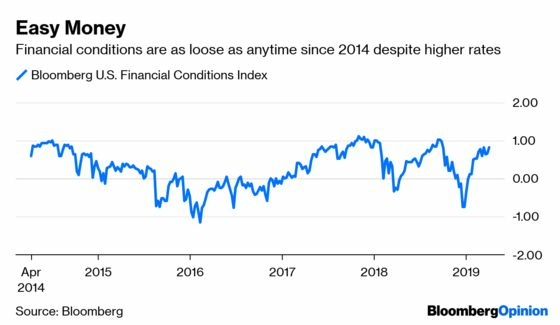 The S&P 500 Index has surged almost 15 percent this year, putting it back to near record highs and suggesting that everything will be OK. The bond market has also rallied, pushing yields lower and causing the so-called yield curve to invert, an event that historically has preceded a recession. Given that track record, many tend to believe that the bond market is sending the correct signal and stocks will, as usual, find their optimism unfounded. That said, there are plenty of signals to suggest the stock market may be right this time and may finally shed its reputation as the “dumb money.” For one, the Dow Jones Transportation Average — whose members include railroad Norfolk Southern Corp., package delivery company FedEx Corp. and trucking firm J.B. Hunt Transport Services Inc. — has rebounded the past two weeks after a monthlong slump. 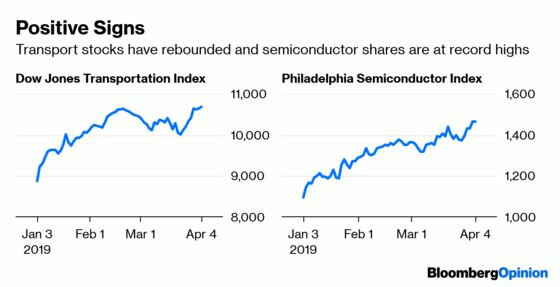 Then there’s the Philadelphia Stock Exchange Semiconductor Index, which is an economically sensitive, internationally exposed benchmark. It just set a record high this week. It’s also notable that the Federal Reserve Bank of Atlanta’s GDPNow Index, which aims to track growth in real time, has risen to 2.07 percent from a “stall speed” level of 0.17 percent just three weeks ago. Maybe it really is different this time. The Borsa Istanbul 100 Index of equities in Turkey soared 4.13 percent on Thursday, its biggest gain since January 2017. The gain is also notable because it came on a day when the broader market for emerging-market equities was little changed. 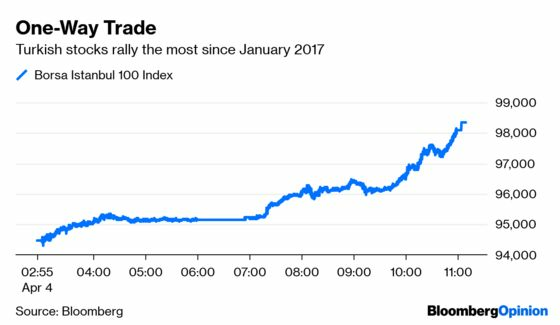 Turkish stocks have been under a lot of pressure the last two weeks as the nation orchestrated a currency crunch to prevent the lira from sliding days before an election that would test support for President Recep Tayyip Erdogan’s rule. The action on Thursday may indicate that investors see Erdogan’s power eroding after his party’s apparent defeat in Istanbul, the city where Erdogan’s political career began. Erdogan has attempted to exert more power over the central bank, so any loss of political power would theoretically be seen as a positive by international investors favoring an independent central bank. Also, S&P Global Ratings said in a report Thursday that Turkey’s overall government debt level is manageable and that the country’s B+ rating is not under “immediate” risk. It was a big day for platinum Thursday, surging as much as 3.53 percent in its biggest gain since January 2017 and putting the metal up almost 13 percent for the year. Platinum is benefiting from the huge jump in palladium, which gained 239 percent between early 2016 and last month, leading many traders to look to platinum as a substitute for use as an auto catalyst. In a sign of growing investor attention, holdings of exchange-traded funds backed by platinum have jumped in recent weeks to reach the highest on record on April 2, according to Bloomberg News’s Rupert Rowling. 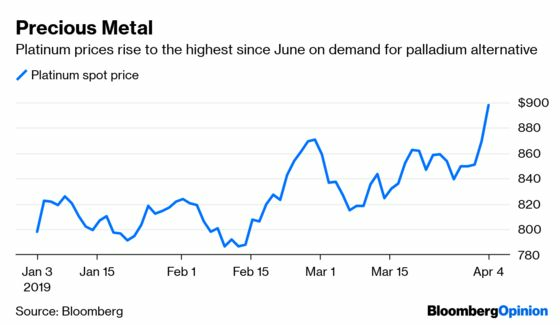 Platinum also received a boost on concern that workers in South Africa, the largest supplier of the precious metal, may succeed in widening a strike to include some of country’s biggest producers. The Association of Mineworkers and Construction Union sought to appeal a court ruling that blocked a planned secondary strike at companies including Anglo American Platinum Ltd., Impala Platinum Holdings Ltd. and Lonmin Plc., Business Day reported. And in a sign that platinum may have reached a peak, retail investors are taking notice. U.S. Mint data shows that first-quarter sales of coins made with the precious metal surpassed the total for all of 2018, according to Bloomberg News’s Justina Vasquez. The monthly U.S. jobs report always draws a lot of attention, but the one due to be released on Friday for March should garner more interest than usual. The question market participants want answered is whether the employment picture is more like the huge 311,000 jobs created in January or the disappointing 20,000 in February. The median estimate of economists surveyed by Bloomberg is for a reading of 175,000, which would be respectable from the viewpoint of the economy. But would the bond market like a number along those lines? 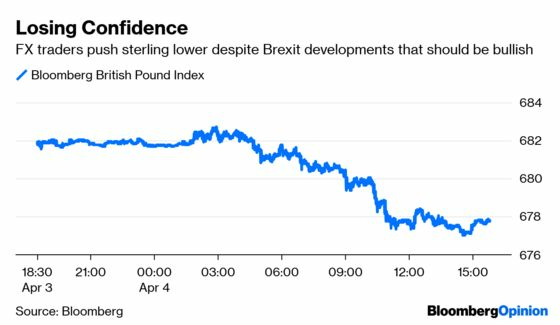 That’s important because the reaction in bonds will help frame the outlook for monetary policy. FTN Financial interest-rate strategist Jim Vogel wrote in a research note Thursday that any number around 225,000 or higher with an unemployment rate of 3.6 percent (the estimate is 3.8 percent) and average hourly wage growth of 0.5 percent (the estimate is 0.3 percent) would be bearish for bonds. Conversely, a reading of 120,000 or lower with an unemployment rate of 3.9 percent and average hourly wage growth of 0.1 percent would be bullish. Anything in between would be a wash.